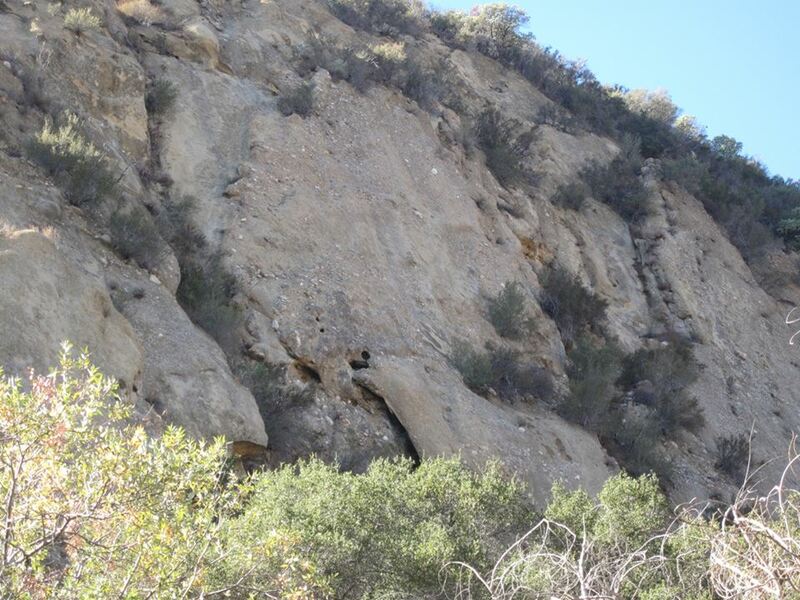 SCVHistory.com | Towsley Canyon | The Great Bee Cave in Towsley Narrows. 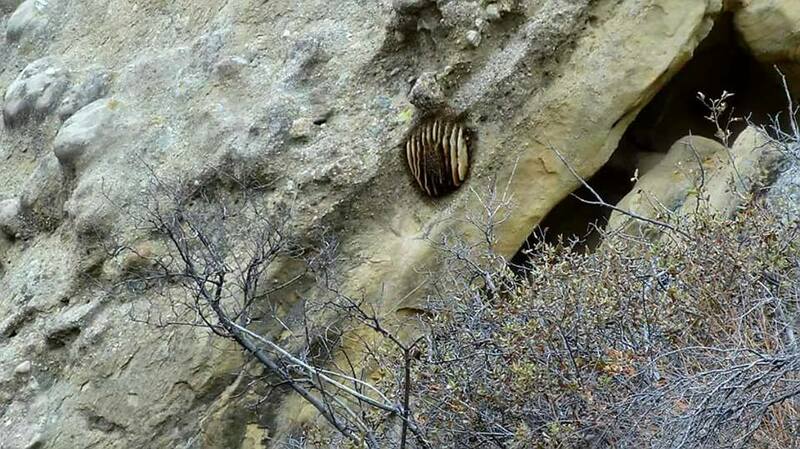 Recalls History of The Great Bee Cave in Narrows of Towsley Canyon. The Newhall Signal and Saugus Enterprise | Thursday, April 5, 1940. Above: Photo by Charitha Eragoda, early 2010s. Click each to enlarge. Above: Photo by Charitha Eragoda, early 2010s. Above: Photo by Stan Walker, November 2017. In Los Angeles county, on the eastern slope of the San Fernando range of mountains, and in the immediate vicinity of the Leaming Petroleum Company's oil region, there is the most wonderful collection of wild honey in existence. 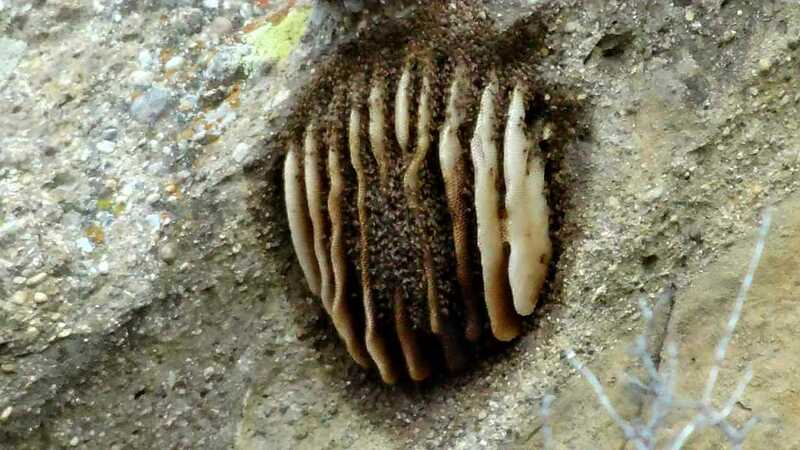 The hive is located in a rift, which penetrates the rock to the depth of probably one hundred and sixty feet. The orifice is thirty feet long and seventeen feet wide; with four passages. This rift was discovered to be the abiding place of a swarm of bees, that is seen to come out in a nearly solid column, one foot in diameter. Certain parties have endeavored to descend to the immense store of honey collected by the bees, but were invariably driven back, and one man lost his life in the effort. Others, at the expense of much labor and money, built a scaffold one hundred and twenty-five feet high, in hope of reaching a place where they could run a drift into the rock and extract its well-hoarded sweets, but finally ceased their work. 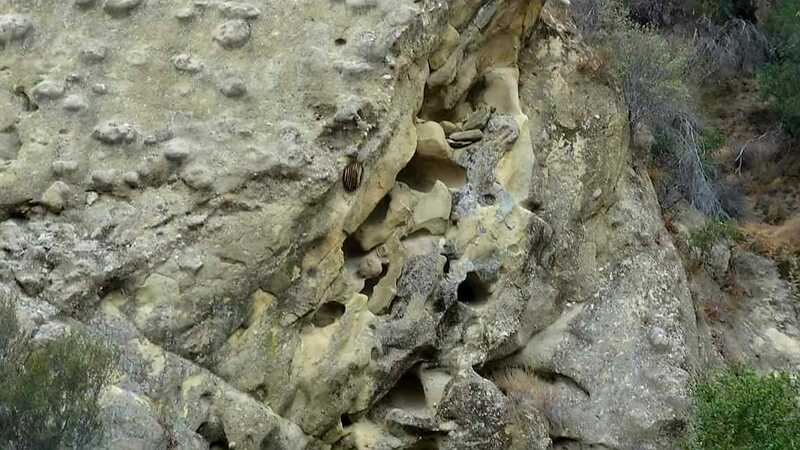 Within four years the bees have added not less than fifteen feet of depth to their treasure, as ascertained by actual measurement, and it is thought that at the present time there cannot be less than eight or ten tons of honey in the rock. A gentleman by the name of B. Brophy lives in a cabin not far from the spot, and obtained from the melting of the honey by the sun's heat more than enough for his family requirements. All through that region stores of wild honey are found in trees, in the rocks, in nearly every place where its industrious manufacturers think (for they seem to think) that it will be secure. They consume a very small portion, as the climate enables them to keep up operations nearly every day in the year, and flowers of some sort are always in bloom. It must be a very severe season indeed when the little fellows are not seen abroad in vast numbers, busily engaged in their mellifluous work. The above narrative is supposed to have been furnished by Wm. Brophy, an early pioneer, who lived on the LaSalle place at the mouth of Towsley canyon. This article was widely published in the East; and residents of this section, at that time, were bombarded with letters from would-be treasure hunters who envisioned a fortune in honey in car-load lots to the man who could solve the problem of robbing the cave. As a matter of fact the cave was not hard to enter, when once a tree was wedged behind the overhanging rock to serve as a ladder, and was robbed many times, often netting the invaders as much as half a ton of comb honey, at a time, until repeated robbings, dry years, and disease wiped out the colony around 1890. I myself, as a small boy, once enjoyed the experience, from the bottom of the. canyon of seeing Tom Waite and my older brother, Lewis Lyon enter and rob the cave. Charlie Moore, of Newhall, is probably the only man now living who had an active part in some of these honey gathering raids. 1. Addi Warren Lyon (March 25, 1873 - February 25, 1951), was the son of Stanford Lyon (1831-1882) and Tafenas Hanscom Lyon. An electrical engineer, Addi and his wife, Edith L. Stevens, lived on the Lyon Ranch in Pico Canyon at 18763 Highway 99 — where Addi and other Newhall children learned their letters before the first true Newhall School opened in 1879. Today it would be the approximate intersection of The Old Road and Pico Canyon Road. The eastern stretch of the Pico road was given his family name by the county in the 1920s (Lyons Avenue). 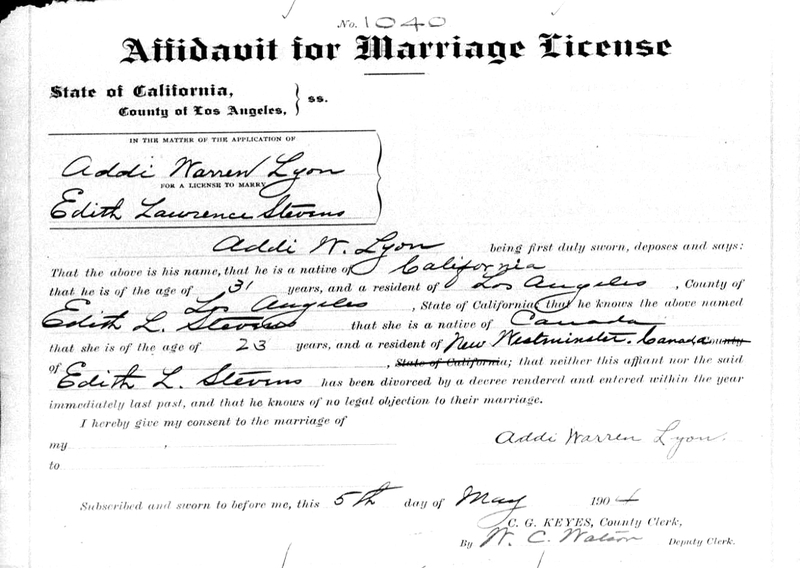 View Addi's marriage license here and his obituary here. He was ineligible for military service because of this injury he sustained as a teenager. The bees have four natural enemies, which we may quote in an ascending scale: moths, lizards, bee-birds, and bears. The first enters the hive, and soon destroys the occupants. The second and third pounce upon the bee outside whenever they have the chance, and swallow him without remorse or vinegar. The fourth does not want the bees especially (though he is said to devour them when laden with honey), but he covets their stock with an insatiate greed. Not even the fear of rifle balls will deter him when he discovers a bee ranch. Swooping down from his mountain fastness at night, he overturns the hives, and fairly wallows in sweets until he is either satisfied, or killed by the infuriated bee-men, who, however, not unfrequently come off second best in the encounter, for bruin is a good fighter, and when he is after honey goes in to win. Formerly the honey was strained by exposure to the sun, but of late years it is generally extracted. The modus operandi of extracting is very interesting to a novice. Long knives, crooked at the handle, are kept constantly heated in boiling water. With these the comb, which is made in frames, is uncapped on each side. The frames are now placed in the circular extractor, which revolves rapidly by means of a crank, when the centrifugal force thus obtained expels the honey, and leaves the empty comb in good shape to be refilled by the bees when placed back in the hive. By this means their time and labor are saved, as they can much more speedily repair any little damage this comb has sustained, in the extracting process, than they can form a new one. 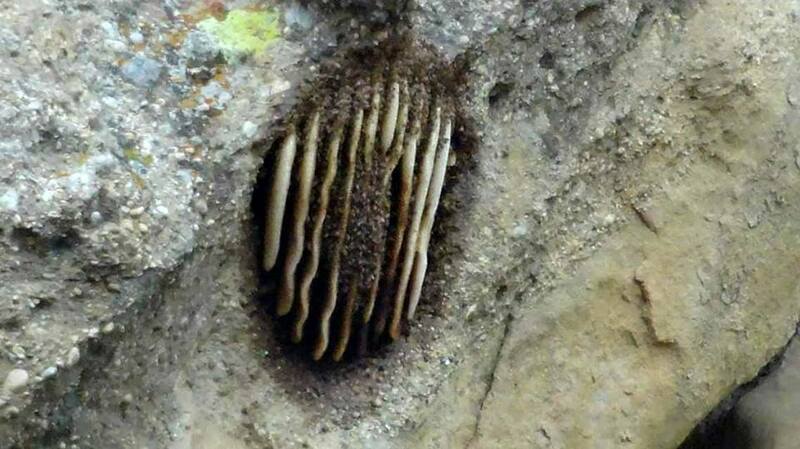 With the same view many bee-men now furnish their hives with artificial combs of bees-wax, partially formed. These the bees go to work and complete, and all time thus saved is spent in gathering honey. But little honey is now shipped from Los Angeles county in comb, as bee-keepers think the time of their bees too valuable as honey gatherers, to keep them constantly making wax. The extracted honey is usually shipped in tins, and in all the best apiaries it is handled with remarkable care and cleanliness. It is claimed that in a good season each swarm will produce three hundred and fifty pounds of honey, double the number of workers, and provide feed for all in addition. The Italian queens, in this climate, are said to average three thousand eggs per day. The feed is principally derived from the flowers of the white sage, which grows in great abundance on the foothills; but failing to procure that, the insects will feed upon and extract honey from any and all plants and flowers they may be able to find. Fruit-men maintain that they destroy large quantities of fruit yearly, and demand protection from their ravages. The assertion is denied by the bee-keepers, and a wordy contest of doubtful issue is the result. Probably some disinterested savan will, some of these days, decide the matter finally, and save further effusion of ink. After careful inquiry the writer is of the opinion that there are fully one hundred thousand colonies in Los Angeles county to-day, and this notwithstanding the heavy losses of a few years ago, when bees starved to death by millions. The Bee-keepers Association of Los Angeles County, was organized August 16, 1873, with nine members: John T. Gordon, W.T. Martin, Henry Beckley, L.M. Rasmussen, Wm. M. Rasmussen, Levi Richardson, Mrs. B. Richardson, A.J. Davidson, and John W. Wilson. The object: "To promote the interest of bee culture in this county." The first meeting was held at El Monte, on Saturday, August 18, 1873, when a Constitution and By-laws were adopted, and the following officers elected: President, John T. Gordon; Vice-presidents, Thomas A. Garey and W.T. Martin; Secretary, Wm. M. Rasmussen; Treasurer, J. C. Barnes. The highest recorded membership is fifty-six.